Walk into this unique store located on the courthouse square in Auburn and you may feel like you’ve stepped back in time. You’ll find yourself surrounded by lovingly preserved display cases that date to the store’s founding in downtown Auburn in 1901. Old photographs and antique memorabilia (including many old advertising pieces that loyal customers have returned to the store after years of displaying them in their homes) lend an air of timeless beauty to the contemporary jewelry and watches that are displayed in the cases. The store’s original ornate wall clock gently chimes on the quarter hour, just as it’s done for more than a century. Maintaining the historic atmosphere of one of Auburn’s oldest continuously operating businesses is important to Carbaugh owner Mike Littlejohn. The pride he feels in his business shows in every gleaming nook and cranny. Littlejohn was born and raised in Auburn. He worked for Robert and Betty Carbaugh (the store’s third owners) for 17 years before purchasing the business from them upon their retirement in 1997. The surroundings at Carbaugh’s harken back to days gone by. The exquisite merchandise displayed in the antique cases, however, is entirely up-to-date. Shoppers here are surrounded by the fine quality jewelry that has made Carbaugh’s a tradition since their great-grandparents’ day. 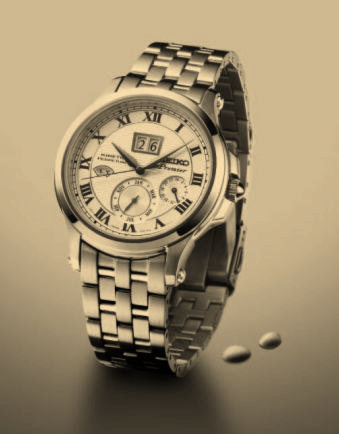 In-store services at Carbaugh’s include ring sizing, shank repair, prong repair, restyling and antique restoration, diamond and colored stone setting, chain and bracelet repairs, insurance and estate appraisals, all types of watch repair including electronic and mechanical timepieces, and repairs on eyeglasses. At the larger corporate jewelry stores, Littlejohn says, customers rarely get to deal with the jeweler/designer who makes their pieces. 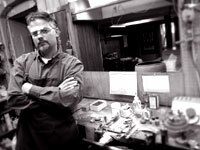 Most of the time, when Littlejohn is in the front of the store, he has his jeweler’s apron and glasses on. It’s not just some costume he wears, either; it shows that he can leave the workbench and also come out front to deal directly with the customers. “So, I’ll offer advice,” Littlejohn explains. “Maybe the piece is significant and shouldn’t be changed. Or maybe it should be taken apart and redesigned. I’m able to offer choices because I’m the guy building it; I can say we need to change this or that in order to make the piece structurally sound. An 80-year-old decorative awning over a downtown Auburn store has been restored to its original condition — or possibly better. 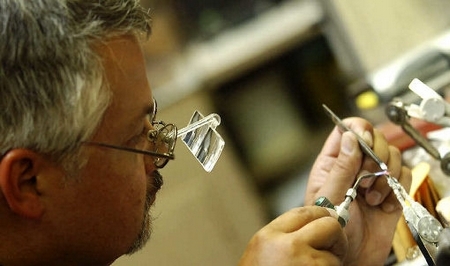 Nearly three months of work went into refurbishing the stained-glass awning at Carbaugh Jewelers on the north side of Auburn’s courthouse square. “Stained-glass awnings like this, you just don’t find them. They just don’t survive,” said Mike Littlejohn, owner of the store. 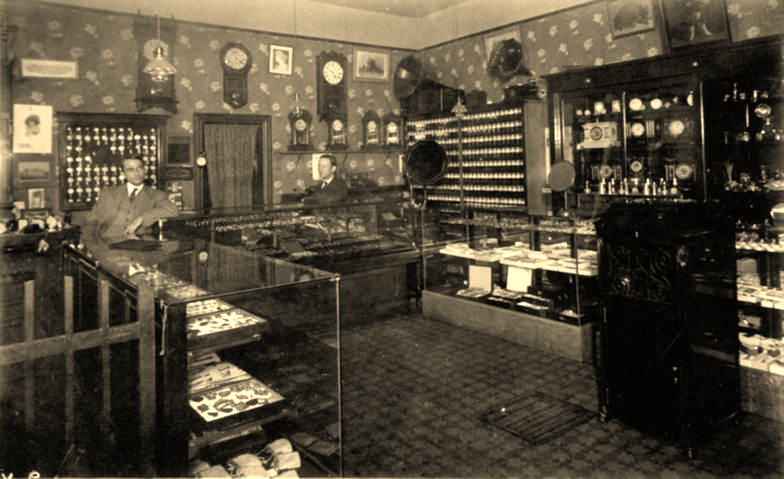 The Carbaugh Jewelers storefront is virtually unchanged in appearance over its 101-year history, however. 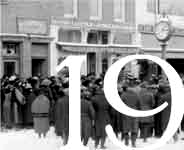 Judging from photographs and accounts of former employees, Littlejohn estimates the awning went up between 1920 and 1925, when such decorations were popular on storefronts. Restoration of the awning started as a simple painting project, Littlejohn said. In the process, Littlejohn discovered electrical conduit leading to each corner of the awning. A brass switch panel inside the store’s front door had one switch that did not appear to be connected to anything. 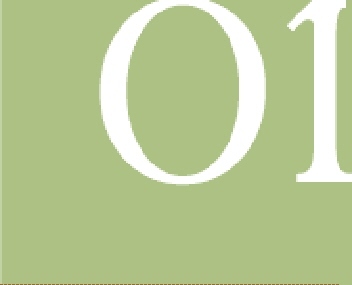 That led him to conclude that at one time, the awning had a lamp at each corner. Littlejohn hired Bob King, a handyman and painter, to bring the awning back to its original glory. King painted the galvanized steel portion of the awning in colors to highlight its egg-and-dart pattern. He then carefully reinstalled the green-shaded stained-glass. 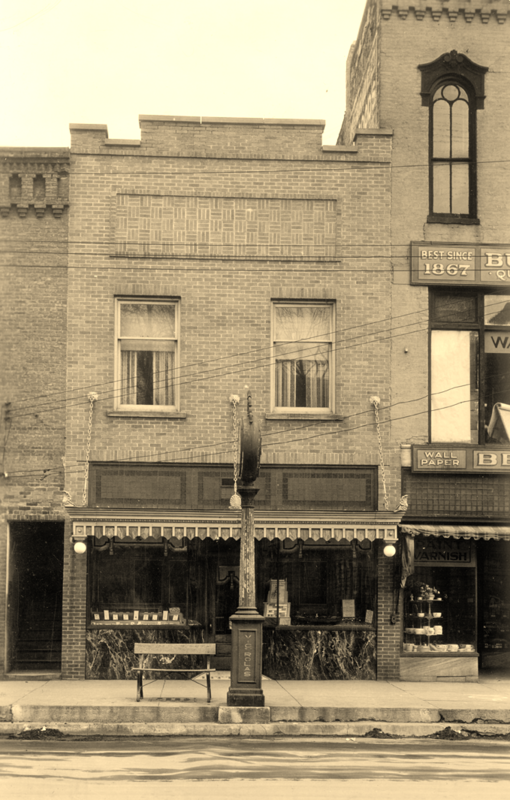 Littlejohn rebuilt the corner pieces of the awning to allow installation of lamps with amber bulbs. Ball Brass & Aluminum Foundry of Auburn is casting three solid brass cornices that will sit atop the awning. Chains connect the awning to lion’s heads attached to the brick facade of Carbaugh Jewelers. Old photographs show that the former J.C. Penney store at Main at Sixth streets once had a nearly identical awning. Today, only the lion’s heads that held the chains remain. 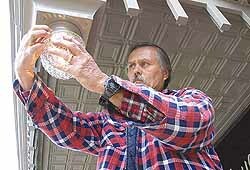 Bob King putting finishing touches on new light fixtures on the completed awning restoration.